Observe symptoms and patterns, document what you see with pictures while inspecting the plants (close-up and general distribution in the field, greenhouse, high tunnel etc.). Download and fill out our form as completely as possible. Provide background information, such as when the symptom first appeared, variety, pattern, and distribution of the problem. consider sharing digital photos before collecting a sample or along with your sample. From the areas where symptoms are starting, developing and developed. Avoid samples with advanced symptoms. A completely wilted or dead plant/tissue is not a good subject to submit. For seedlings samples: send whole plug trays, leave the plugs in the tray, (see example below). 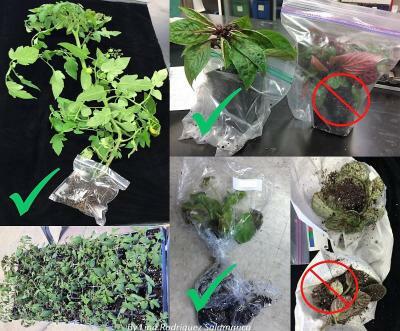 If individual seedlings, make sure to keep the root ball and any media contained in a plastic bag or aluminum foil. Do not add paper towels or water along with the sample. Excess moisture can cause rapid deterioration of the sample and proliferation of secondary organisms. 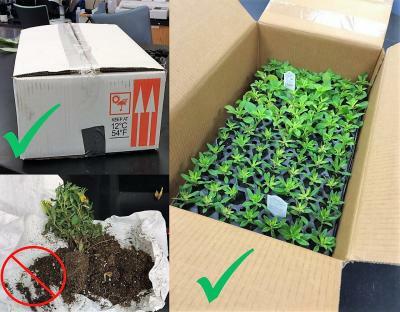 Pack your wrapped sample tightly in a box to prevent dislodging the soil. Ship the package early in the week via overnight delivery. Walk-ins are welcome!